With the new e-cigarette trend, users have been told that the vapors from these kinds of cigarettes do not harm their teeth. The real truth is that any form of nicotine whether from traditional cigarettes or electronic ones can cause periodontal disease. Currently there seems to be no real regulations on who can get their hands on these e-cigarettes, and thus kids are dabbling in the use of e-cigarettes under the auspices that it is perfectly safe. The real truth is that nicotine decreases the blood flow in your body. Nicotine is a vasoconstrictor, meaning it reduces blood flow. As a result, less oxygen and nutrients are fed to the gums. If less oxygen reaches the gums, a smoker has a higher probability of suffering from gum disease over their life. Since more teenagers are using e-cigarettes, there has been an increase of gum disease in younger people. This is why regular checkups are crucial, especially if you smoke traditional or e-cigarettes. Once the gum disease begins, it can spread throughout your mouth and affect your blood stream if ignored. It is important to visit your dentist like the ones at Bailey Family Dental in Hartland Wi regardless if your are a traditional smoker or e-cig smoker. With less oxygen and nutrients reaching the gum line, your gums can become recessed, bleed, experience inflammation, along with many other issues. For instance, you can be experiencing a loose tooth, bad breath, sores in your mouth and tooth loss. Nicotine can cause all of these symptoms and more. Nicotine can also lead to mouth and lung cancer. Additionally, smokers experience yellowing of their teeth, which requires teeth bleaching and other treatment. Regardless of whether e-cigarettes are promoted as a “healthier” alternative to smoking, any form of nicotine puts your teeth, gums, and jaw at risk for dental health problems. The best method of preventing periodontal disease is to floss regularly, avoid nicotine, visit a dentist regularly, and eat well. 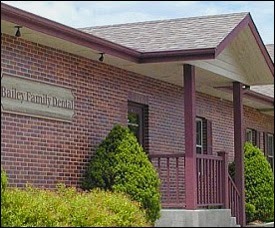 Serving Waukesha, Oconomowoc, and Hartland Wisconsin, Bailey Family Dental is most concerned with your comfort. Hartland Dentists Drs Terese and Richard Bailey and their friendly staff will explain treatment options and give estimates before you begin your treatments. To learn more, feel free to go to our website at http://www.bailyfamilydental.com, or call us at 262-369-8633. Our office is located at 557 Cottonwood avenue, Hartland Wisconsin.